Lara tells me her hens lay one egg a day. But not everyday, she adds. We walk into the hen-house and I meet all the chickens. She walks over to the laying boxes and picks up an egg and hands it to me. This is Dottie’s egg. Dottie’s egg is small and heavy. And while I have painted with fresh egg yolk before, I’ve not actually met the chicken that laid it. Lara and I are bartering eggs for peaches. She has 6 to give me on that particular afternoon. I feel the preciousness of each one. Especially when I take Dottie’s egg into the studio and prepare to work. I’ve been asked to paint an arm and hand. Between meeting the chicken who laid the yolk I use and because of recent issues with my hand – the task comes with new meaning. I pay careful attention to each layer, each structure. The painting begins as a casein ↑ until I receive fresh eggs ↓. While I have worked with egg tempera for years, it always feels like something new to me. Each time I use it, it feels like I struggle with it – until I don’t. Lara is a fellow artist and Yogi, as well as a masseuse. Before I leave her home she works on both my hands a bit. Thank you Laura. And thank you Dottie. The basic ingredients for egg tempera painting are egg yolk, water, and dry pigment. My hands hurt. Clearer yet, my fingers ache. It’s not the joints though. I began this life-size hand and arm last week. I set it from the ground up – bones, muscles, tendons, veins, nerves – studying each layer as it goes over another. I prepare the background so as to imply fascia. It’s far from complete. I paint in egg tempera which I’ve not used in a good while. The size of the composition and the pace I move at work with the material of choice. I can’t help but be amazed by the structure of our body. The hand is complex and so perfectly set up to allow us to do the many things we do with it. I have a hard time believing it’s all random. As I study – I do wonder who designed the spectacular object. I lost track of time and painted 5 hours steady yesterday – could be why my hands hurt. Monica we are visiting Phoenix and just had a yoga class at Desert Song … and fell in love with your work. Especially the ‘Subtle Female Back Body’. Anita said she loved another work, ‘Handstand’? Could we make an appointment to view your work or give you a call this morning? Marti and her husband John are in my studio by noon, and when they leave they take 4 artworks (technically 3) with them. In between we talk about their children, dogs, cats, quilt-making, wool, yarn, travel, fishing and of course – Yoga. They spend time looking at the various large figure studies I am painting. They respond to them and I appreciate the dialogue. 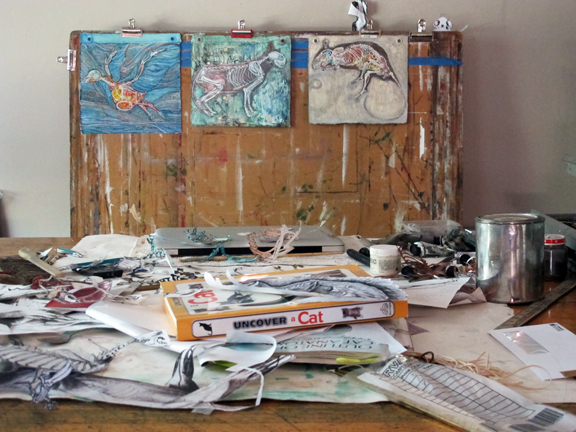 As we move through the studio they see and like my recent animal anatomy compositions. In particular they like the 2-sided hanging works on paper (this is why I consider this one work two). 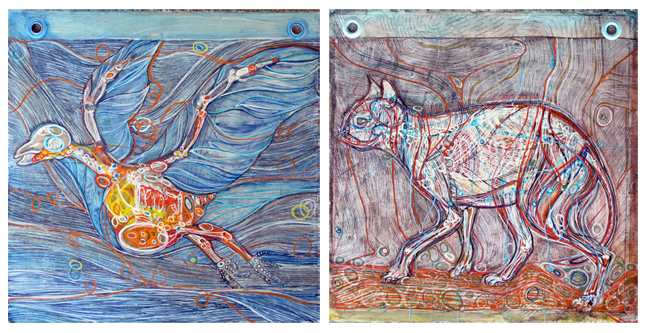 They choose the cat and bird – titled Earth and Air. I talk about the hanging system and how I am playing with ideas for larger work. John explains another type of hook/hardware to me. He wonders if I have any fish images. I do not. They are heading to a fishing store after our studio visit. Did I mention Marti and John live in Portland, Oregon. This work is collage (with architectural renderings), painted, sanded and varnished. The cat is egg tempera, the bird is casein. I mention the durability of casein. I tell them about it’s earliest known use in Egyptian work. Casein is a binder. Consequently with all that layering they are stiff works of paper and designed to hang in space, as opposed to being framed and on the wall. They also choose 2 reproductions – images I had printed on plexiglass. The originals are casein (bee) and egg tempera (cat). Marti likes The Cat and John likes The Bee. I explain the reproductions are also experimental ways of finishing and hanging an image. While all of it can hang traditionally, it can also hang uniquely without framing. My animals will be residing in Portland. Thank you Marti and John. It was good to meet you. John enjoy your fishing and Marti, quilt-making is great work – get into that studio. This series I painted this summer was experimental. I’ve shown you all the stages in earlier posts, and mostly I thought I was complete with it. The small works have taken quit a bit of my time and attention. Yesterday I took sandpaper to the work and I varnished it. I loved the look. Though it’s not, the work somehow appears more fragile. The cat is casein, gesso and graphite. I took a sandpaper block to the entire surface, and then went back in to add highlight to parts of the work. I covered the composition with casein varnish. 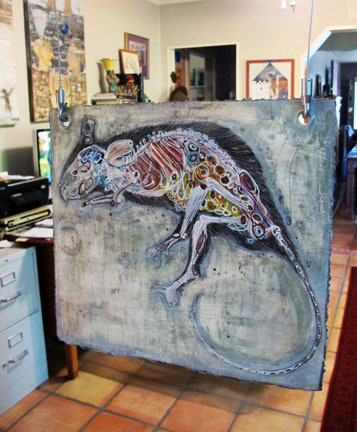 I also sanded the egg tempera rat below and took the casein varnish to it. I don’t know if you see the surface marks the varnish accentuates. The work has a soft sheen and almost appears like a painting on metal. But these are 2 sided prepare paper. They hang in space. I hung one work this summer and saw a number of people touching it. It drove me a little crazy. But now they’re protected. I never met for them to show, I was just playing with materials and ideas. Like I said, this was experimental, I didn’t plan to show the anatomy studies. But as it is the series will show at the Tempe Center for the Arts, in December. They’re varnished, which means they’re now protected. The edges of the paper are also protected. And TCA set me up with cool hangers that I like. 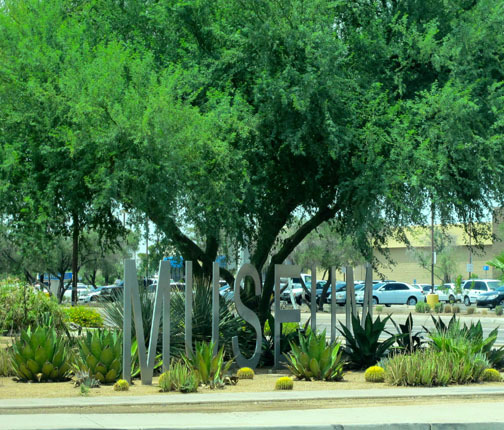 Christy Brown organizes the Tempe Community Galleries exhibitions. She explains that in conjunction with the Tempe Center for the Arts Gallery’s Smithsonian “Green Revolution” exhibition (which opened last January), all the community gallery shows will have “going green” themes this year. Raw opens today. 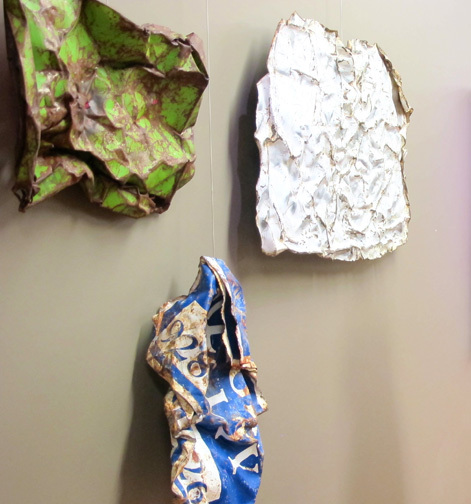 The exhibition focuses on the work of three artists who are choosing to move away from the use of harsh chemicals and synthetic materials in their work, and are instead working with raw, recycled or organic materials. I am one of those artists, as are Joe Willie Smith and Aimee León. An artist and certified sheep shearer, uses natural raw wool along with recycled industrial materials. 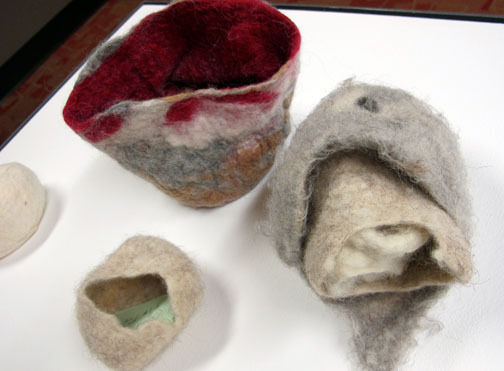 The show includes a number of her small and soft – object forms . Most are beautiful tactile vessels. I want to touch them all. 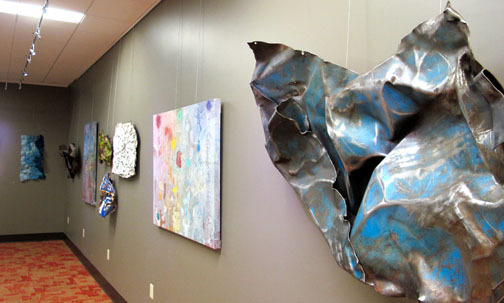 A multi-media artist and musician includes works in metal. He works with found objects and repurposed material. He talks in general about finding just the right piece and then in particular about the white form below – how he scratched/drew on it one early morning to catch both the light and shadow of the sunrise. I have several posts about Joe Willie’s work and our collaborative effort at sound making – which I’ve used as background for all the Nothing In Stasis videos. Raw includes a number of my paintings and one small drawing. I work with organic material, primarily egg tempera and casein. I like to refer to my mediums as egg and milk. This work below uses casein as underpainting, and egg tempera as the surface color. I plan to drop off work and head back to the studio to paint, but when I learn Joe Willie is in the exhibit and he’ll be dropping work off, I wait for him. And as it all plays out we spend the morning working with installer, James Sulac. Before Christy leaves for the morning she mentions how the work might hang. She asks which side of the wall I want my work on and I tell her. But after Joe Willie arrives and we begin seeing how interestingly things connect, we suggest the work hang in the space mixing together. Below are a few install shots. I understand we connect in terms of the raw materials theme, but as I look at everything I appreciate Christy’s eye more and more. The organic forms of León’s soft sculpture connects to the light forms and color in my paintings and to [the appearance] of softness in 2 of Willie’s larger pieces. And you probably can’t tell from these photos (below) but the colors and lines in Joe’s work connect to my use of the same design elements. 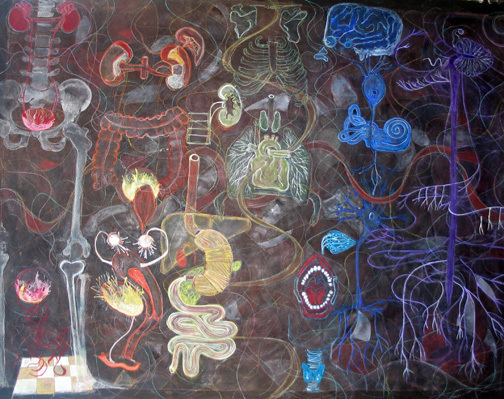 The acid green of his sculpture (below) runs right through the mid-section of my painting to the left, and is high-lighted by reddish pink points in both works. Joe Willie decides grouping his smaller pieces salon style will enhance the grouping of shapes in my compositions, and vice versa. I regret not getting shots of another wall where León’s wall pieces hang along side Joe’s and my work, a similar soft glow of lavender and blue shows up. Somehow all the work organizes between fragility and strength. It’s Raw and you’ll just have to go see for yourself. As you arrive watch for the Museum marker below, on the corner of Southern and Rural. I finally complete one set of two paintings on one prepared sheet of paper. This came about because Carolyn gave me a sheet of drawing paper prepared in the way she prefers to work with it. I prepped two more sheets and have been working on several 2-sided design. They all relate to a cat in one way or another. I should note again: Carolyn uses graphite and acrylic wash and does not work on both sides of the paper. Because I am experimenting I decide I will paint one side in casein, and the other in egg tempera. Normally I mix the two mediums, but I want to know how they each respond to the surface. Both mediums work well, laying bright and smooth. My brushes and my rags like the feel too. These images are stages of the casein bird. I collage architectural renderings (I found in a trashcan the day I started all of this) onto this one paper and prepare it the same way. I have to adjust things so the design continue to show through. It’s how the background comes to be in this set. Look closely – you see the line work I follow, paint and scratch over. Casein takes to the surface well – egg tempera even better. I’ve already showed you the cat at its completed stage, (I show it again here below), and here is the finishedl bird which I worked some more, until I liked it. I did experiment with a hanging system. I have to finesse it. It’s very possible this work will hang in downtown’s 515’s art space, in June for there 515 to the 5th exhibit where each member invites 5 artists to show a small 12″ x 12″. Mary Shindell invited me. 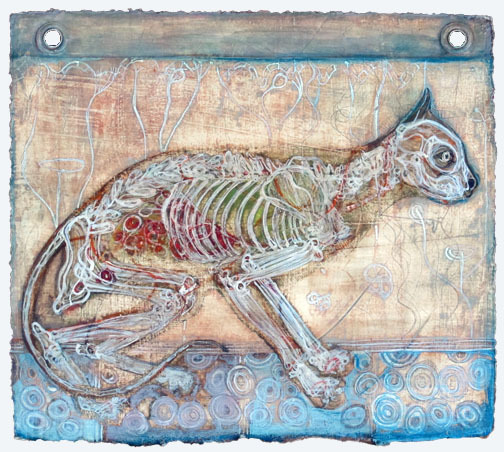 Below is the (egg tempera) cat at an early stage so you can see the collage line work, and then the final image. I am thinking about the title. If you have an idea let me know. Una Gata / Un Pájaro … simple. La Tierra / El Cielo … I like this one. Tierra y Aire … I like this one. Aversion and Attraction … This amuses me. or … The One That Got Away.